RTX 2060 might be the cheapest Ray Tracing card but it is a powerful graphics card with performance that can match cards one or two segments higher than it, not necessarily in the same GPU family. 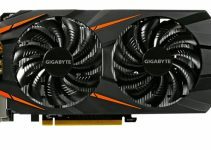 The card is positioned below RTX 2070 and is much cheaper than it , but offers performance that is close to it. Both these graphics cards belong to the same RTX 20 series lineup and supports Real Time Ray Tracing, AI / Deep Learning and DLSS. In fact, both of them share the same GPU core which accounts for lot of similarity between these two cards. The launch of RTX 2060 created some confusion among the gamers that whether they should go for the cheaper RTX 2060 or spend a little more to get RTX 2070 for some extra performance in gaming. So, clear all your doubts regarding this, here I am going to put a straightforward comparison between them, so that you can choose the one that is well suited for your gaming and professional needs as well. 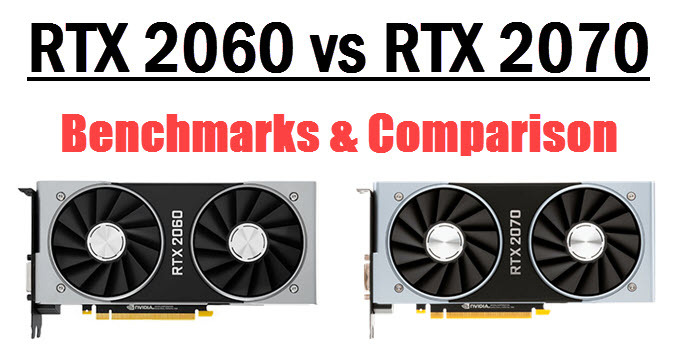 Here is a comparison between RTX 2060 and RTX 2070 graphics cards based on their specifications, gaming performance, features, power consumption and pricing. Both these graphics cards are built on the Turing architecture with 12nm FinFET manufacturing process, and they also use the same GPU Core, which is TU106. 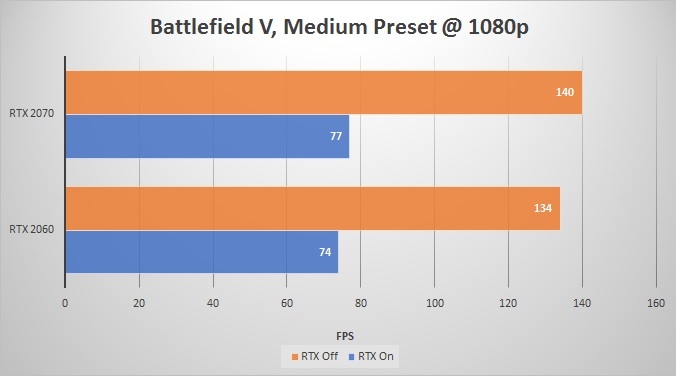 The RTX 2060 is basically a cut down of the TU106 GPU with some cores unlocked. RTX 2070 comes with 2304 CUDA Cores, 288 Tensor Cores and 36 RT Cores while RTX 2060 has got 1920 CUDA Cores, 240 Tensor Cores and 30 RT Cores. Both these cards support Ray Tracing and AI/Deep Learning because of these RT Cores and Tensor Cores. These cards use the latest GDDR6 memory having same clock speed (14Gbps), but the amount of memory and memory bus width is different between these two cards that also affects the total memory bandwidth between the two. RTX 2060 has got 6GB GDDR6 memory with 192-bit interface, offering bandwidth of 336 Gb/s while RTX 2070 comes with 8GB GDDR6 memory having 256-bit interface and generates 448 GB/s of total memory bandwidth. 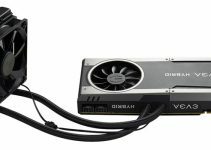 The extra 2GB memory and higher bandwidth makes RTX 2070 a better choice for 4K gaming and other video memory intensive tasks, possibly 4K / 8K video editing. 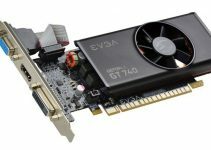 Both these RTX cards come with same set of features that include support for DirectX 12, OpenGL 4.5, Vulkan, Nvidia Ansel, GPU Boost, Nvidia G-Sync and are VR Ready graphics cards. They do lack SLI multi-GPU support, which is only present in the higher end RTX cards that include RTX 2080 and RTX 2080 Ti (using NVIDIA RTX NVLink Bridge). RTX 2060 and RTX 2070 do fully support Real Time Ray Tracing and Deep Learning Super-Sampling (DLSS) in supported games. Also, both of them include USB Type-C connector that supports VirtualLink for hooking up next generation Virtual Reality Headsets for an immersive Virtual Reality Gaming experience. Here are some benchmarks of RTX 2060 and RTX 2070 in some popular AAA games at 1440p Ultra graphics settings. 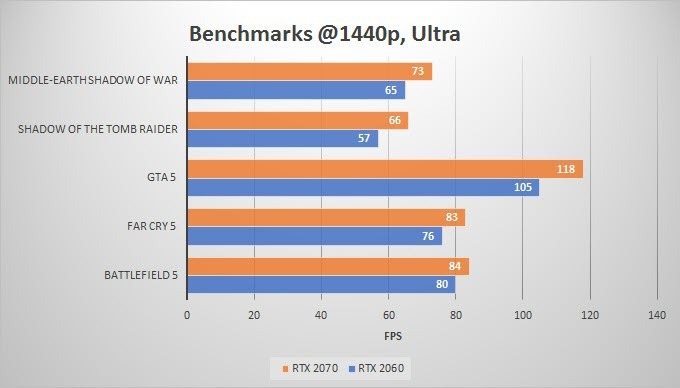 RTX 2060 is only 12% – 13% is slower than RTX 2070 which is a small margin, and upon overclocking it can meet the level of performance of RTX 2070 to some extent. When compared to Pascal series cards then RTX 2060 is as fast or even better than GTX 1070 Ti, while RTX 2070 is certainly better than GTX 1080. When it comes to power consumption then the difference between them is not huge as RTX 2060 has power consumption figure of 160W and requires a 500W PSU. On the other hand, RTX 2070 has 185W of power consumption and needs a 550W PSU for its working. There is a large difference in price between these two cards. The Founders Edition of RTX 2060 and RTX 2070 sells at $349 and $599 respectively. This means RTX 2070 costs almost the double of RTX 2060. 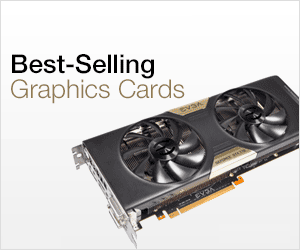 The pricing for these graphics cards from add-in board partners or third party graphics card manufacturers may vary and you can check out the current prices of RTX 2060 and RTX 2070 from the links given below. Also both these cards are readily available for purchase. Well, at the end I would like to say that both these cards are very powerful and packs some really advanced tech that includes RT cores and Tensor Cores. This makes them very good for workstation tasks too. In terms of pricing, RTX 2070 is kind of okay but RTX 2060 is an amazing value for money product, and can even match the performance of RTX 2070 when highly overclocked. 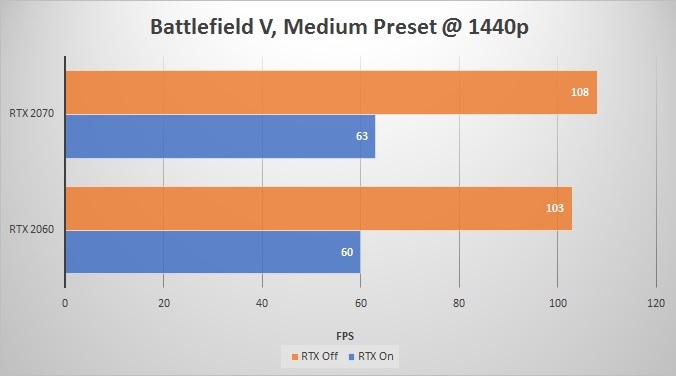 However, the only department where RTX 2060 lacks is the amount of VRAM, because 6GB of VRAM in current scenario can suffice 1440p gaming but for 4K gaming it is not sufficient at all for the upcoming titles. So, if you want a powerful budget RTX graphics card for 1440p gaming then you cannot go wrong with RTX 2060, and you want something a little better to future-proof your gaming PC by spending some extra bucks then RTX 2070 is the card for you.